(d) Enter the following menus: Body Electrical / (desired system) / Data List. Use this item to determine if the shift position switch is malfunctioning. The engine cannot be started when this item is OFF. When the shift lever is in P and the engine switch is off, if any door is opened then closed, the steering is locked. When the key is inside the vehicle and the engine switch is turned on (ACC) or on (IG), the steering unlocks. The engine cannot be started when the steering unlock signal is off. Use this item to determine whether the stop light switch is malfunctioning. When this item is malfunctioning, the engine can be started by pressing and holding the engine switch for a certain period of time. If the engine switch is pressed for a short time, the display may not change. 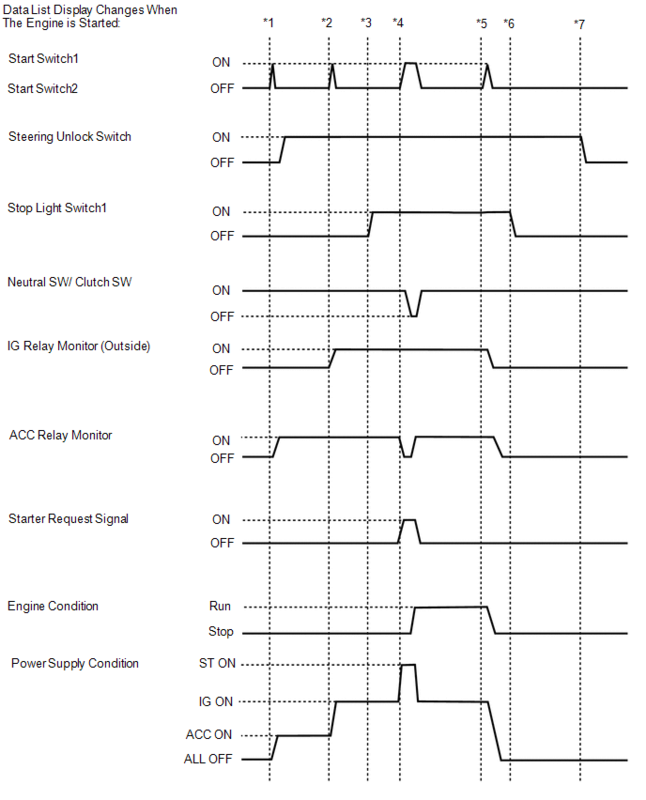 Use this item to determine whether the engine switch input signal is malfunctioning. Backup for engine switch 1. However, when the engine switch is pressed and held, the control functions only when both engine switch 1 and 2 are normal. Behaves the same way as engine switch 1. Use this item to determine whether the park/neutral position switch is malfunctioning. When the engine cannot be started due to a park/neutral position switch malfunction, OFF is displayed. Displays in almost the same manner as the IG1 and IG2 relays. When the engine switch is on (ACC), OFF is displayed. When the engine cannot be started due to a start request signal malfunction, OFF is displayed. When the engine switch is pressed, the duration of time that ON is displayed will be extremely short. As such, the engine switch needs to be pressed and held for a certain amount of time. When the engine switch is on (IG), ON is displayed. While the engine is cranking, OFF is displayed. Use this item to determine whether the IG relay is malfunctioning. When the engine cannot be started due to an IG relay malfunction, NG is displayed. The engine can be started even if the result is Yes. However, emergency engine off while driving by pressing and holding the engine switch and, when the brakes are malfunctioning, emergency engine starting by pressing and holding the engine switch cannot be performed. Even when Yes is displayed, it is still possible to turn the engine switch off (the power source mode will not be stuck in on (ACC) or on (IG)). When the engine cannot be started due to a steering lock or unlock malfunction, Yes is displayed. When the engine cannot be started due to a key verification error, Yes is displayed. To check if the Data List display changes, get into the vehicle while carrying an electrical key transmitter sub-assembly and perform the following operations with the engine switch off and the shift lever in P.
*1: Press the engine switch with the brake pedal released and check that the engine switch is turned on (ACC). *2: Press the engine switch with the brake pedal released and check that the engine switch is turned on (IG). *3: Depress the brake pedal (stop light switch is on). *4: Press the engine switch with the brake pedal depressed and check that the engine starts. *5: Press the engine switch with the brake pedal depressed and check that the engine switch is turned off. *6: Release the brake pedal. 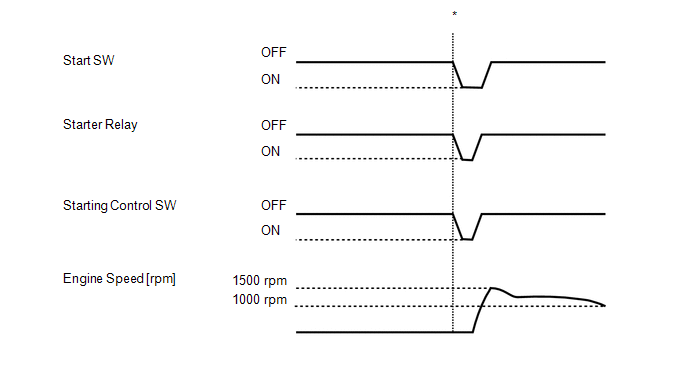 The electrical key transmitter subassembly sends voltage information to the certification ECU (smart key ECU assembly) when it is transmitting. The certification ECU (smart key ECU assembly) displays "Yes" for the "Key Low Battery" item of the Data List when this voltage information indicates 2.2 V or less. This Data List item should be checked when the electrical key transmitter subassembly is at room temperature (example: at -20°C (-4°F), "Yes" may be displayed even if the transmitter battery is new). The engine cannot be started when Set is displayed. The security indicator light blinks when Set is displayed. The security indicator light is linked with set/unset of the immobiliser and not linked with steering lock/unlock. When OK is displayed, the certification ECU (smart key ECU assembly) receives an unlock confirmation signal from the steering lock ECU (steering lock actuator or upr bracket assembly) and makes fuel injection and engine starting possible. The engine cannot be started when NG is displayed. OK: History of malfunction for the lock or unlock sensor in the steering lock ECU (steering lock actuator or upr bracket assembly) does not exist. NG(Past): History of both the lock and unlock sensors in the steering lock ECU (steering lock actuator or upr bracket assembly) being on exists (Under normal operation, neither sensor is on). When NG (Past) is displayed, either the position sensor in the steering lock ECU (steering lock actuator or upr bracket assembly) or the assembly itself may be malfunctioning. This item displays history when a malfunction exists in the circuit between the certification ECU (smart key ECU assembly) and the steering lock ECU (steering lock actuator or upr bracket assembly). History of a malfunction in the steering lock motor circuit in the steering lock ECU (steering lock actuator or upr bracket assembly). L code has not been registered for the certification ECU (smart key ECU assembly) or steering lock ECU (steering lock actuator or upr bracket assembly). Steering cannot be unlocked (the engine cannot be started). 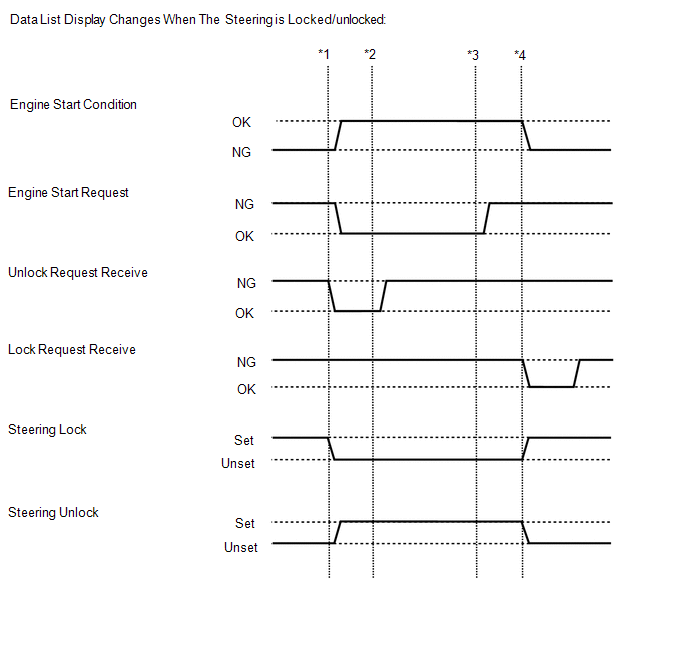 The engine cannot be started when an unlock request signal cannot be received. If OK is not displayed even though the steering unlock conditions are met, the certification ECU (smart key ECU assembly) may be malfunctioning. The reception state is maintained for 10 seconds. When 10 seconds or more elapse after receiving the signal, the item changes to "NG". OK: Lock request signal received for 10 sec. of any of the doors being opened with shift lever in P and engine switch off. If OK is not displayed even though the steering lock conditions are met, the certification ECU (smart key ECU assembly) may be malfunctioning. When Unset is displayed, the steering wheel is not locked. When Unset is displayed, the steering wheel is not locked (the engine cannot be started). When OK is displayed, the steering lock ECU (steering lock actuator or upr bracket assembly) has an IG2 input circuit malfunction. *3: Press the engine switch and check that the engine switch is turned off. *4: Open any of the doors (steering locked). When malfunctioning, the engine will not crank. OFF is displayed when the engine cannot crank. When malfunctioning, the engine cannot crank. *: Check that the engine starts when the engine switch is pressed with the power source mode on (IG), shift lever in P and brake pedal depressed. (d) Enter the following menus: Body Electrical / (desired system) / Active Test. OFF: Power is not supplied. The engine switch illumination is off (15 seconds or more have elapsed since it turned from on to off) and the engine switch is on (ACC) or on (IG), or the engine is running. The electrical key transmitter subassembly is in the cabin and the engine is stopped.